Most people are pretty familiar with the correlation between fiber and regularity. These days if you watch TV for even a little while, you will notice how we are inundated with ads for medications related to maintaining regularity and good stomach health. But rather than go down that path, we should understand why fiber is crucial to our general health and that we need to make sure that we eat enough of it on a daily basis. So what exactly is fiber? In short, fiber is an indigestible type of carbohydrate. Fiber only comes from plant sources. It is the fibrous part of fruits, vegetables, grains, and legumes that when eaten passes through our digestive system without being broken down. Thus, our body does not absorb any nutrients from it and it gives no calories, but it does provide our body with lots of health-related advantages (Slowik). There are two kinds of fiber: soluble and insoluble. Soluble fiber, as the name suggests, is soluble in water. It forms a gel-like substance in our digestive tract that slows down our general digestive system. It is found in oats, barley, citrus fruits, apples, dried beans, peas and carrots. Another example is the over-the-counter fiber laxatives that usually contain psyllium (Psyllium is the outer husk of a plant called Isapgol or Ispaghula). Insoluble fiber, on the other hand, absorbs water. It can be found in whole-wheat flour, wheat bran, nuts, and beans, various vegetables like cauliflower and potatoes, and peels of fruit (Dietary). Both soluble and insoluble fiber can add bulk and softness to stool, making it easier to pass. It also helps in moving stool along faster and more regularly, which really helps people who have constipation or irregular bowels. There are some foods like oatmeal and beans, which contain both soluble and insoluble fiber. It is generally best when one eats a wide variety of plant-based foods that tend to be high in fiber (Dietary). The benefits of having fiber in our diet are tremendous. Fiber not only helps us maintain our digestive health, but it also plays an important role in weight loss. Since it takes longer to chew and digest, fiber can keep you full for a longer time and can help prevent overeating. Since fiber lowers the absorption of sugar and starch in our digestive tract, it helps in lowering cholesterol and triglycerides for better cardiac health while helping to prevent and manage Type 2 diabetes. Furthermore, consuming the proper amount of fiber can even aid in the prevention of many types of cancers. It is unfortunate that people in the United States do not eat the bare minimum daily requirement for fiber (25-30 grams), despite the many health benefits fiber can offer (Cohen). Even though high-fiber foods are good for your health, adding too much fiber too quickly can result in gas, bloating etc. You should increase fiber in your diet gradually so that it gives your digestive system time to adjust. Always remember to increase your water intake along with that as fiber works best when it can absorb water and swell up making the stool soft and bulky (Dietary). We should try to minimize our consumption of processed foods, as they are not only high in sugar, salt, and various chemicals, but they are also generally stripped of fiber. White flour is a prime example where all the fiber has been removed in the name of processing (Slowik). Furthermore, it is best to get your fiber from natural resources rather than resorting to over-the-counter pills or powders. Man-made dietary supplements can provide specific kinds of nutrients, but still cannot replace the myriad of vitamins and nutrients that come with the consumption of fresh fruits and vegetables. And they never look or taste as good either! Hopefully you will try some of the recipes in this blog using ingredients like flax, quinoa, beans, and other healthy ingredients, which are all wonderful sources of fiber. Cohen, Bradley. “Why Is Fiber Important in Your Daily Diet?” LIVESTRONG.COM. LIVESTRONG Foundation, 11 Jan. 2014. Web. 16 Apr. 2014. 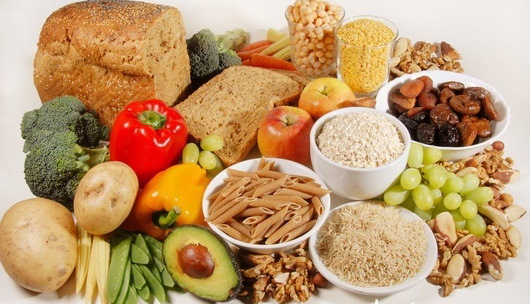 “Dietary Fiber: Essential for a Healthy Diet.” Healthy Lifestyle. Mayo Clinic, 2012. Web. 14 Apr. 2014. Slowik, Guy. “What Is Fiber?” EhealthMD. N.p., 16 Apr. 2013.
good reminder to add enough fiber in our diet regularly.